We have worked on numerous private property impound towing projects, and we know the importance of a fast and comprehensive private property towing job. Our tow technicians manage all types of towing needs for private property in the Temecula, CA area. Since 1980, we have been recognized as the chief business for private property impound in Temecula, CA. 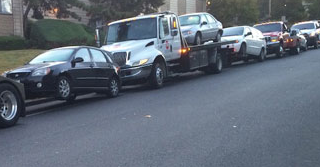 We make sure the vehicle is towed properly off of your residential or commercial property. When you call, we either come directly to you quickly, or our staff sets up a date and time to remove the vehicle. Our company delivers private property towing service you can rely on. For 37 years, we have helped Temecula property owners get unwanted vehicles away from their home or business. We operate a locally owned and operated towing company, and our goal is to keep your parking lot or parking spaces for you and your customers. Our towing crew delivers quality workmanship in a timely manner and within your price range. Our tow trucks are fully-equipped with everything we need to deliver quick and effective private property impound towing. We are here for you when you need us, and you can depend on the same exceptional towing work each time you call. We are trained to effectively troubleshoot and resolve problems for any type of private property towing in the Temecula, CA area. Regardless what type of tow you need to be done, our objective is your absolute satisfaction. At Temecula Tow Company, we are committed to crafting long-term relationships with our customers. We are proud of how we provide the Temecula community with affordable private property towing solutions that are affordable and competent. We work with you, creating open and honest communication to guarantee that you receive service you can rely on. We are the principal private property impound towing contractor and our towing crew has been giving low-cost towing help for 37 years. Whether it is a car or truck, our goal is to clear your property of vehicles that aren’t supposed to be there. During your appointment, we come to your location to see what type of vehicle it is and to remove it immediately. Our team gets the problem corrected and your parking lot back to the way it should be which is filled with cars that belong to the property owners and their visitors. If you need a private property tow, don’t hesitate to contact us. This is what we do and what we are here for. Hiring us to take care of your towing needs in a crisis is the best way to resolve the problem right away. When a vehicle is just sitting in or around your home or business for a long period of time, there is nothing better than knowing you have a Temecula towing company that can come to the rescue.